Fueled by the lack of bad news out of Europe, the market continues its climb back to the 2012 high it reached in April. There is hope that fiscal and monetary cooperation in the region could keep the fiscal crisis from spinning out of control. However, recent market optimism aside, debt-related problems in the global economy will hamper economic growth creating more risks over the next five years. These risks have kept many investors on the sidelines or in the wrong sectors when they should now be strategically investing to use other people’s fear to their advantage. For example, prospects for decent returns outside of the U.S. are starting to improve. 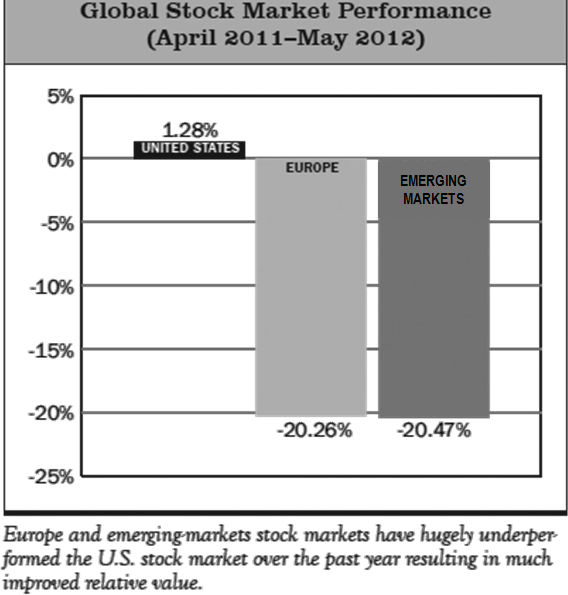 Long-term opportunities have surfaced because foreign market returns have been so dismal over the past year. Although risks remain that we can’t yet dismiss, this 22% return gap (see chart) is one of the largest ever and presents a golden opportunity to buy great global companies at a significant discount. Our portfolio positioning is driven by a weighing of risk and potential reward and assessing opportunities before investing. As a result, our portfolios are not only somewhat underexposed to global systemic risk, but are also invested quite differently from most standard benchmarks. For example, we’ve had almost no European exposure for nearly a year, but are now looking to strategically add exposure to selective opportunities. In each of the last three years, there have been strong market rallies early in the year followed by market corrections ranging from 9% to 19%. These volatile market conditions are one reason we maintain a long-term fundamental and valuation-driven approach. This disciplined investment approach allows us to resist the emotional pull of these ups and downs so that our decision making is not impaired. For long-term investors, the silver lining is that these price declines continue to generate good buying opportunities (as they have in the past) and provide better long-term returns. In summary, there are no easy solutions. The debt problems faced by Europe and the U.S. are likely to be with us for awhile. Furthermore, it is hard for investors to gain confidence when they see the markets roar for a month or more, only to be followed by a surge in scary headlines and sharp sell-offs. While this environment does not foster a relaxed approach to investing, it does offer up opportunities to those willing to do the research and take advantage of the volatility. As always, our motivation is to stay clearly focused on making money and managing risk. Certain material in this work is proprietary to and copyrighted by Litman Gregory Analytics and is used by Manchester Financial with permission. Reproduction or distribution of this material is prohibited and all rights are reserved.